It's party day! You'll find me in the corner sipping on my pumpkin martini. Avoiding eye contact. Scrolling Instagram and counting the minutes until I get to go home. Wait. This is an internet party. I can attend from my couch. Sweet. Enough about me. Did you check out the fantastic pumpkin projects from my lovely co-hosts? Those are some classy looking pumpkins up there. You can link up on any of our blogs listed below. 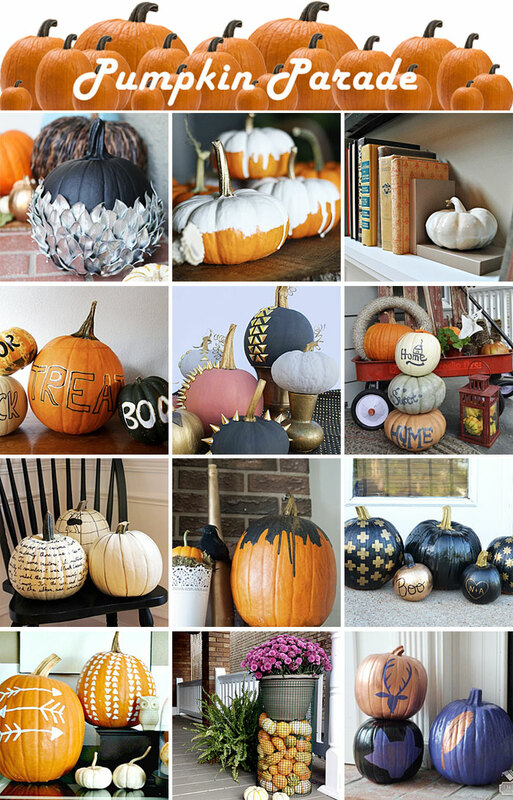 Please use a permalink and link to as many projects as you wish, as long as the posts involve pumpkins. The linky below will stay live through Tuesday, October 15th. Next week, each of us will spotlight a few of our favorite projects on our blogs. We’ll also pin those projects on our shared Pinterest board. 1. Please share a pumpkin post - could be decor, crafts, cooking or anything else pumpkin. 2. Please link back to the Pumpkin Parade and at least one of our blogs. All would be awesome. Just copy this! 3. Put that pumpkin martini down and please go to at least one other blog and comment. This is what makes the parade extra fun. Mandatory fun is the best kind of fun. Can’t wait to see your projects! Check back here on Sunday for our fall home tour!